Fruits basket are a perfect gift when you want to visit your near and dear ones. Fresh fruits are loved by everyone and no one can ever refuse to accept this delightful fruit basket. 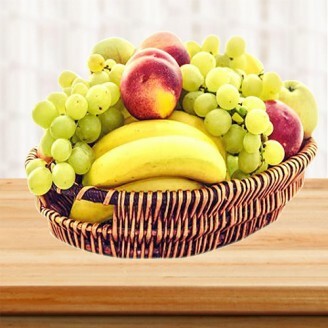 This fruit basket comprises of seasonal fruits weighing half kg each such as Apple, Bananas, Grapes, Oranges, Kiwi, Pears, Cherry- all of them are as fresh as if plucked recently. The basket is a thoughtful gift for your loved ones who will certainly appreciate your effort to get this lovely amalgamation of different fruits for them. 1/2 kg each decorated fruit basket. The fruit are seasonal and fresh- no compromise on the quality is made and you get a lovable and decorated assortment of various fruits. Get your fruit basket from Gift Jaipur with fresh and juicy fruits.